The state of California has released a comprehensive summary of outcomes of California licensed homebirth midwives of the year 2010. The reports makes for disturbing reading. Homebirths exceed low risk (and sometimes high risk) hospital birth on almost every negative outcome including deaths. Before we look at the outcomes, let’s look at whether California licensed homebirth midwives comply with their own rules. The first thing to note is that although all midwives are required to report outcome statistics, 16% never bothered to report their outcomes. The second is that midwives are required to consult with and generally transfer care to obstetricians if a baby is known to be breech or in the case of twins. Nonetheless, California midwives delivered 13 breech babies and 5 sets of twins at home. Let’s look at the basic statistics. There were 2245 who planned homebirths at the onset of labor. 1840 delivered at home, for a transfer rate of 18%. There were 205 C-sections for a C-section rate of 9.1%. How about outcomes? Simply put, the outcomes are dreadful as the chart below demonstrates. The fetal mortality rate was 11/1000 compared to the California rate for white women (all gestational ages, all pre-existing medical conditions, all pregnancy complications) of 4.9/1000 for a rate more than double that expected. The intrapartum mortality rate was 2.6/1000 compared to the expected rate of 0.3/1000, for a rate more than 8 times higher than expected. The neonatal mortality rate was 0.9/1000 compared to the national rate for low risk white women of 0.4/1000, for a neonatal mortality rate more than double that expected. A perinatal mortality rate of 12/1000 compared to the California rate for white women (all gestational ages, all pre-existing medical conditions, all pregnancy complications) of 5/1000 for a rate more than double that expected. These numbers potentially under-count the real death rates for 2 reasons. First, among reported perinatal outcomes after transfer 11 were classified as unknown. Second, fully 16% of California homebirth midwives failed to report their outcomes. How about birth complications? There were quite a few considering that the mothers were extremely low risk. Untimately, 14 mothers suffered serious complications resolved by 6 weeks and 1 mother suffered serious complications that persisted beyond 6 weeks. 21 infants suffered serious complications resolved by 6 weeks and 4 suffered serious complications that persisted beyond 6 weeks. First and most important, despite the fact that the homebirth population presumably represents the lowest of low risk patients, the neonatal death rate is double that expected for low risk white women. The overall perinatal mortality rate is double that for all white women in California (including premature births, all pre-existing medical conditions, and all complications of pregnancy). Second, homebirth in California has an extraordinarily high rate of intrapartum death, more than 8 times higher than the intrapartum death rate for women of all races, all gestational ages, all pre-existing medical conditions and all complications of pregnancy. While rigorous intermittent auscultation might be equivalent to electronic fetal monitoring under experimental conditions, that is clearly not true of intermittent auscultation as practiced by California homebirth midwives. In a population this size, we would expect that every woman who enters labor with a live baby will deliver a live baby. Instead, 6 babies died in the course of labor, because midwives didn’t recognize fetal distress and/or didn’t transfer in a timely fashion if they did recognize it. Third, these results probably underestimate the dangers of homebirth in California because a substantial proportion of information is missing. The bottom line is that homebirth in California increases the risk of perinatal and neonatal death by 100% or more. California homebirth midwives, like all homebirth midwives, “trust birth” and birth, far from being trustworthy, is inherently dangerous. 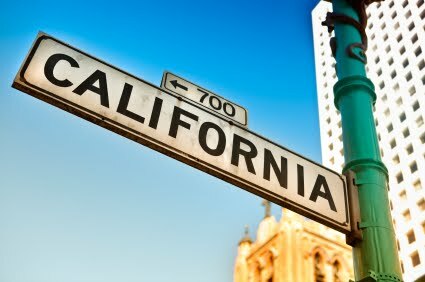 California birth outcomes can be found here. For more information on the source of the homebirth statistics: Licensed Midwife Annual Report user guide. 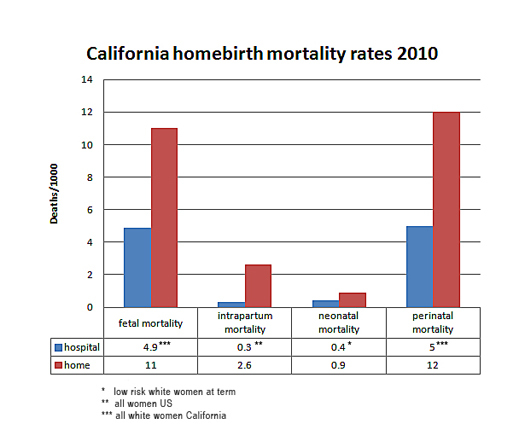 addendum: Ideally, the California homebirth statistics should be compared to the mortality rates for California women in 2010 without any of the following risk factors (in order of importance): African descent, prematurity, pre-existing medical conditions and pregnancy complications that occur before onset of labor. Unfortunately, the mortality rate of that group is unavailable, so each comparison is made with the available group having the least number of risk factors. In the case of neonatal mortality, the comparison group is hospital birth for low risk white women at term for 2007; for intrapartum mortality the only available group is all women; for fetal mortality the best available group is California white women of 2009; similarly for perinatal mortality the best available group is California white women of 2009. Practically speaking, the substitution of these groups means that in all cases besides neonatal mortality, the correct comparison group would have much smaller mortality rates and that, therefore, the real increased risk of homebirth is much higher than that depicted here. It is also important to note that homebirth appears to be associated with dramatically higher rates of intrapartum mortality, a vanishingly rare event among low risk women at term. Therefore, the figures that I routinely quote demonstrating that homebirth has a neonatal mortality rate at least 3 times higher than comparable risk hospital birth, dramatically underestimate the true risk. How come we have a higher maternal & fetal mortality rate than than countries who regularly home birth? It seems to be that the US just stinks on BIRTH safety in general….in fact twice as many moms die TODAY in hospital births than those that died in the late 80’s…what about THAT??? We need to improve outcomes for sure, but attacking homebirth as an OB when your own profession is having a higher (100% higher) mother death death rate than 20 yrs ago is a bit of the pot calling the kettle black I think. And not that it matters, but I have always done hospital birth & will be again in a few weeks….but my choice is not everyone’s & I am not an idiot & assume that I know what is right for anyone other than me…and neither does anyone else, no matter what letters are behind their name. Actually, that’s a really interesting question, and I’m glad you asked it here, as the answer might surprise you. During the 1990s, US health authorities changed the definition of maternal mortality! That’s why the numbers are so much higher now, and why US numbers are higher than other first-world countries. Currently, any time a pregnant or recently postpartum woman dies, the coroner is supposed to mark it as a maternal death if pregnancy could possibly have been a factor. Died of food poisoning or asthma while pregnant? Well, you might have survived if you hadn’t been pregnant, so we’re going to call it a maternal death. Back in the ’80s, they only called it maternal death if it was directly caused by pregnancy, like pre-eclampsia or postpartum hemorrhage. When you think of maternal deaths, you may be thinking of women who go into labor reasonably healthy and die during or immediately after the birth. This used to happen all the time 150 years ago, and it still happens all the time in the poorest parts of the world, but it almost never happens in the USA now. If it did happen, it would probably make headlines and end in a lawsuit against the hospital. Statistics are really complicated, and misuse of statistics is extremely common. So stick around, keep asking questions, and keep learning. I loved my babies and gave them the best…. an OB with an education.. and a safe hospital setting.. why would anyone take a chance with thier childs life?? It’s a sick world we live in that would promote abortion over childbirth. Bottom line, you have to find the physician or midwife you can trust. The eugenicists run the hospitals and they desire most to drain your insurance policies. Remember that. You’re best path is to detox your body before conception, get in shape and get the proper nutrition. This will ensure a health mother who would be capable of delivering a healthy baby. I’m waiting for a whale.to link. You quote an article from the Daily Mail which doesn’t link to the original study, and is notorious for its horrible medical reporting, you use the word “detox”. You also don’t understand that 14 deaths in 1.5 million women makes a first trimester medical abortion orders of magnitude safer than continuing a pregnancy, which arguably means that no one should have to continue a pregnancy they don’t wish to, when the alternative is safer. You may not be as smart as you think you are. You may not even be as smart as I think you are, and I’m less than impressed so far. Well, we have “medicalized” the child birth process. Consultations are geared around maximum profit under the guise of “safety.” If it’s the “safety” of the mother and fetus, why are hospitals and health care practitioners pushing unnecessary treatments and vaccinations? How many are killed via those processes? What am I getting at? You’re going to have to face the danger. Women desiring or expecting need to read ahead get get prepared. A healthy woman who hasn’t been skipping out on nutrition and exercise will have much better chances of delivering a child. You go enough decades and a child birth wasn’t a huge drama. Now it’s treated as though some kind of foreign object is being [surgically] removed from a woman’s body and she ends up with a massive hospital bill. Why not prepare yourself and with your healthy body, deliver the child in a more comfortable surrounding with competent assistance? Then there’s the whole idea that the State has to move in to take over your child. No, the infant does not need a bazillion vaccinations upon entering the world. In fact, the infant doesn’t need any. Is there a danger to home births? Sure! There’s always a risk. Or you can put all of your trust in the hospital and they can have a medical malfunction. In my opinion, people should not subject themselves to the con-artists in the white labcoats. Find a competent medical professional and seek advice early on. If you want children, start preparing your body beforehand. Physical fitness and pre/post-conception nutrition go along way to a successful delivery and healthy baby. Unfortunately, most of the women are physically weak (due to a lazier society) and unable to push the baby out. When you enter the hospital, you walking into a zone of almost zero responsibility. If you or your baby end up dead, they can just say.. oops! Of course the same can be said for home births. My opinion, research your options and get in shape. You and you alone are responsible for a healthy child and you don’t need Big Pharma/Health Care to make it happen. I’m sure the grieving homeborth loss mothers will be reassured to know it was their fault their babies died. Oh, and mothers of premature babies must have done it wrong, too. How nice to hear. Your opinion isn’t really germane to the topic, or, in fact, in any way accurate. A topic, BTW, which was posted a year ago. You can come and play with us on the more recent posts if you want. I hope this is satire because it is amusing. I’m not amused; I’m depressed. There are actually people out there who think like this??? The lack of critical thinking is astonishing. I’m not going to bother with this one. There are some people who post here and argue who I believe can be helped by pointing out facts and reason and helping them to rethink their misconceptions. This one seems beyond help to me. When has childbirth ever been “not a huge drama”? Not at any point in recorded history, that I’m aware of. OMG. Seriously. Where is that Andy fellow? I found one of your homebirth compatriots! !